The Right Reverend Tim Thornton, Bishop of Truro. Looking for a miracle. No. This is not an over-optimistic secularist or a cleric from a rival Christian sect spreading disinformation about Anglicanism but an Anglican bishop telling the Church of England that, basically, unless a miracle intervenes, and there have been precious few of them since we introduced universal education, the Anglican Church is about to expire. No less an authority than the Bishop of Truro estimates that the Church has about six years left, such is the decline in attendance and income. His diocese alone has a deficit of £1.2 million and has had to ask it's dwindling congregation for a 28% increase in donations. Leaving aside the obvious alarmism being used to bid for more money from both his parishioners and the Church central funds to prop up his diocese and avoid cuts in stipends (clerical salaries), the closure of another tranche of churches and the merger of even more parishes, the Bishop may well not be far off the mark. Just about every study over the last few years has painted a gloomy picture for the church (and a thrilling picture for those of us who would like to see an end to this malevolent superstition and its parasitic clerics). Everything has pointed to an accelerating decline with about the only crumb of comfort coming from a recent study which suggested that, since the decline in absolute numbers is a function of the number of remaining affiliates, the total annual loss of members will fall as membership approaches zero. This of course comes as no surprise to anyone who has been following the spectacular growth of secularism and non-belief in the UK (and the rest of Europe) in the last few years, and especially since almost universal access to the Internet became the norm, although the downward trend in religious affiliation started long before that. Access to the Internet has, of course, exposed people to the dishonesty and insanity of fundamentalism and creationism as well as to the naked greed of those who operate faith-based scams for a living and exploit people's credulous gullibility and desire for a sense of self-importance which can only be satisfied by a belief that the Universe exists just for them. Universal education, including education in science. Increased travel and contact with other people and cultures, and exposure to different ideas and opinions through the media of radio and television. Increased prosperity, security and general standard of living in post-war, social democratic Europe, and an increasing rejection of class barriers and social stratification. Better standards of health care, especially in perinatal care and a huge reduction in childhood deaths due to infectious diseases. Space exploration, giving a more realistic view of Earth's place in the Universe. Emerging stories of clerical abuse of power, blatant hypocrisy, criminal conspiracies and an arrogant assumption that they are above the law and accountable only to themselves and the same senior clerics who were complicit in the abuse. Better education, especially in the sciences has made people less inclined to settle for easy answers and has taught people not only the need to question assumptions but how to question those assumptions. It has also removed much of the ignorance on which superstitions depend. Increased contact with other people and cultures has given the lie to claims by clerics that adherence to their particular brand of superstition was essential for a civilised society to function properly and that anything else would be the end of civilisation as we know it. People can see for themselves that different people with different beliefs or no beliefs at all live in perfectly normal, civilised societies with not an Anglican vicar in sight. Increased prosperity and security has made people less inclined to fall for a superstition that told them, whilst things might be pretty grim today, after you're dead, everything will be better - providing you do as you're told. In fact, leading a hard life with few prospects of anything better in this life is all part of God's plan to test your fitness for something better later. Better healthcare has made the fear of death more remote and has produced fewer dead loved ones in the form of wives and children, to need the solace of imagining them in Heaven, so rendering people vulnerable to the platitudes of clerics who sell this superstition and exploit people's vulnerability for a living. Space exploration has shown us that we live on an unimportant little blue dot in a mighty cosmos which would barely register it's passing, let alone be concerned about each and every one of us. The idiotically parochial belief that the entire thing was created by magic by a special magician just so he had somewhere to put us, his special creation, and that we each have a close personal relationship with this creator, is just too absurd for educated, rational people to believe. Accounts of clerical abuse which have emerged as people become less deferential and afraid of clerical power has shown the underlying hypocrisy in religion and revealed basic character flaws in many of those who actively seek trusted access to vulnerable people under the guise of love and obedience to gods. Where once priests would have been trusted without question, now many people would hesitate to leave them alone with their children. If the priests don't believe a moral god is watching their behaviour and making note in order to call them to account in an afterlife, why should anyone else? And where is the morality in a religion that teaches by example that you can do what you like so long as you say sorry to an invisible friend afterwards whilst fighting tooth and nail against compensating or making amends to your victim? But the biggest problem facing the Anglican Church is the very thing that was once its main strength - the fact that we inherit our cultures, including our superstitions and basic assumptions from our parents and authority figures in our community. The single most important reason why most English people were Anglican, just as the most important reason why most Irish people were Catholic, most Greeks were Orthodox and most Iraqis are Moslem is because their parents were. Now most English new parents are non-believers and most of their children will be. 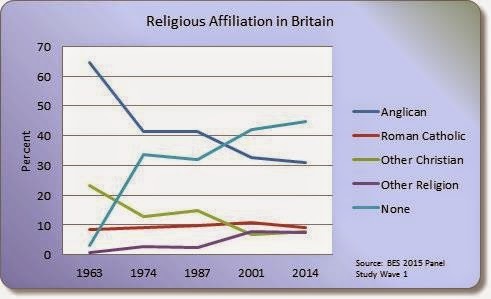 The only demographic in the UK which is increasing by internal growth as opposed to immigration is Atheism. The Bishop of Truro may well be right and Anglicanism has as few as six years for a miracle to happen. Congratulations to England. I think you have what's happening exactly right -- modernity has made people capable of seeing this garbage for what it is and they don't need it any more. I hope to see the day when we in the US can say the same. Unfortunately there's still a very long way to go. Look for example here: http://whyevolutionistrue.wordpress.com/2014/11/17/where-did-life-come-from-god-or-naturalism-the-data-from-the-u-s-vs-the-u-k/ . According to that reviewed survey 59 percent of the British respondents have a naturalistic - that is a non-supernatural and/or non-spiritual - view of how Universe and life began. In the U.S. only 25 percent believe in naturalism. Not surprisinglly those respondents supporting the Republicans (GOP) in the U.S. are the most creationist believers and science disbelievers/deniers. It makes me sad although Rosa's blog article has a lot of good news for heathens/atheists.